Hi, dear friends, if you´re somewhere around Los Angeles on March 5, 2016, mark your calendars. I would like to invite you to a group show "Time Machine" that I am proudly part of at The Hive Gallery. I feel very honored to share the wall at the gallery with so many wonderful artists. Come and see us. My art will be available for adoption during the show or after directly through the gallery. This is my new digital art work "Trinity II." that I made for this show. 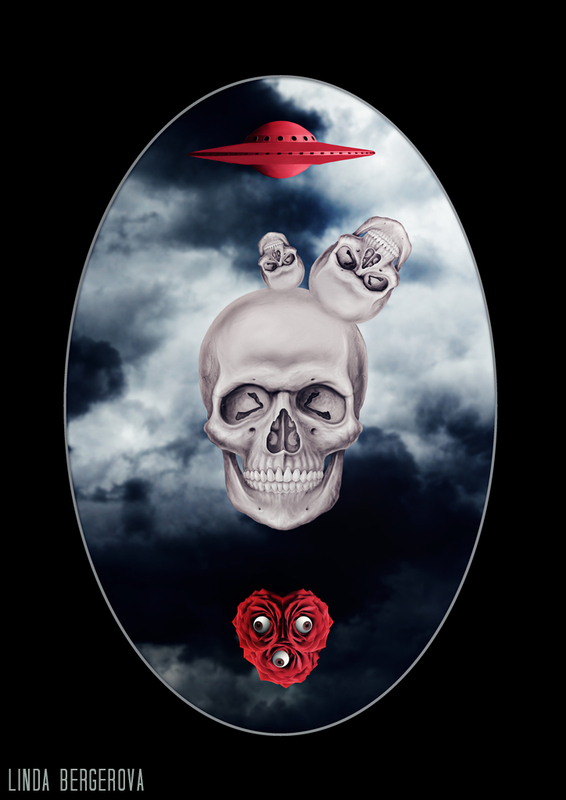 Little peek of my new work "Trinity II." for upcoming group exhibition "Time Machine" at The Hive Gallery in Los Angeles. Opening March 5, 2016. My art will be available for purchase during the exhibition or after directly through the gallery. 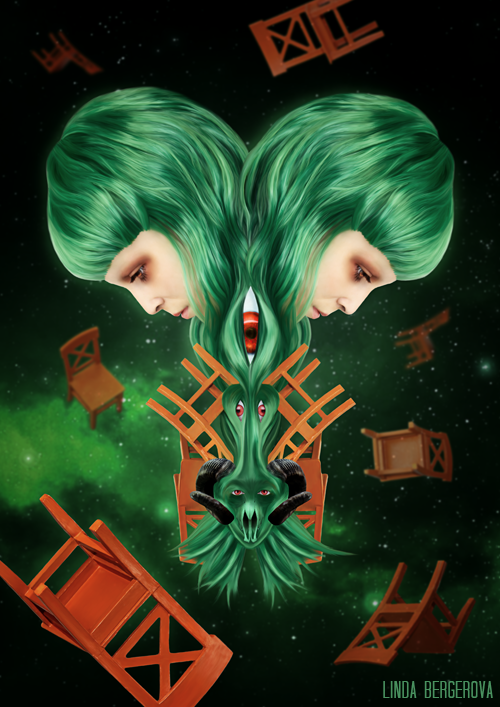 Digital surreal art "Tree of Chairs"
I am happy I can finally show you my new digital surreal artwork "Tree of Chairs". I have been inspired by surrealism, ancient knowledge, metaphysic, demon of nature and beauty of nonsense. I feel very honored to have this work included in Low to Pop exhibition and its still on view at Funarte Gallery in Lisboa till 21st December. The framed print is available for purchase via gallery. For more info or purchase, please, contact neberra@gmail.com . 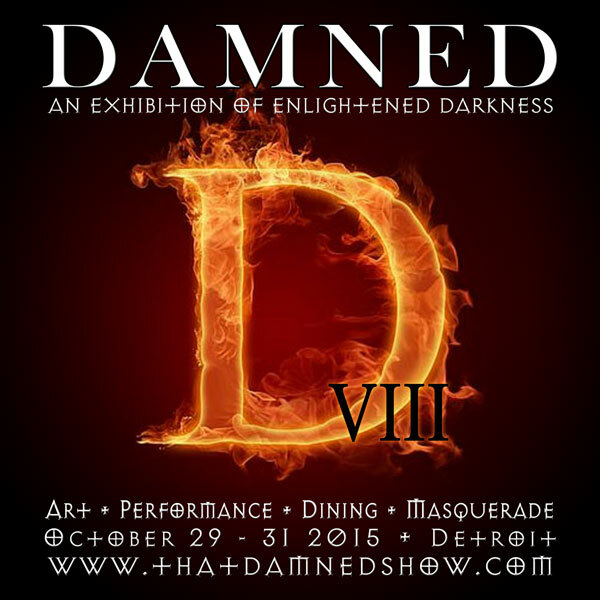 On October 29th through 31st 2015 in Tangent Gallery Detroit comes the 8th annual assemblage of artists from across this world to display their most introspective creations at DAMNED VIII. – an exhibition of enlightened darkness. I feel very honored to be included in this show, thank you very much! My art will be available for purchase during the show or after. DAMNED is an exhibition of the intensely personal creations that are often born from within the artist’s most shadowed hours. This art can be the grace that returns them towards the light, the guide to discover new paths of self or simply the embodiment of rages, denials, abandonments and realizations. Within the word, it is easy to envision devils and hellfire. However, it also reflects the eternal condemnation of self and the subtle mind against itself. It may reflect the emotional trappings within the haunting ghosts of the past. Perhaps the binding tendrils of our deepest longings or deprivations. DAMNED is an exhibition of those extraordinary artists who know that without darkness, there is no light, that beauty does reside within the repulsive and enlightenment within our darkest hours. This art may be the one true reflection of self that make us balanced within our personal damnations ... or possibly it is an expressive visual therapy ... or simply a sign that there is amazingly inexplicable inside without comparison. 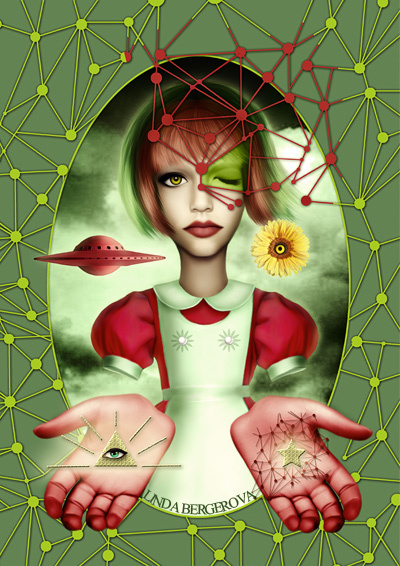 Digital dark surreal art "Trinity I." Finally I can reveal my girls from my new artwork "Trinity I." 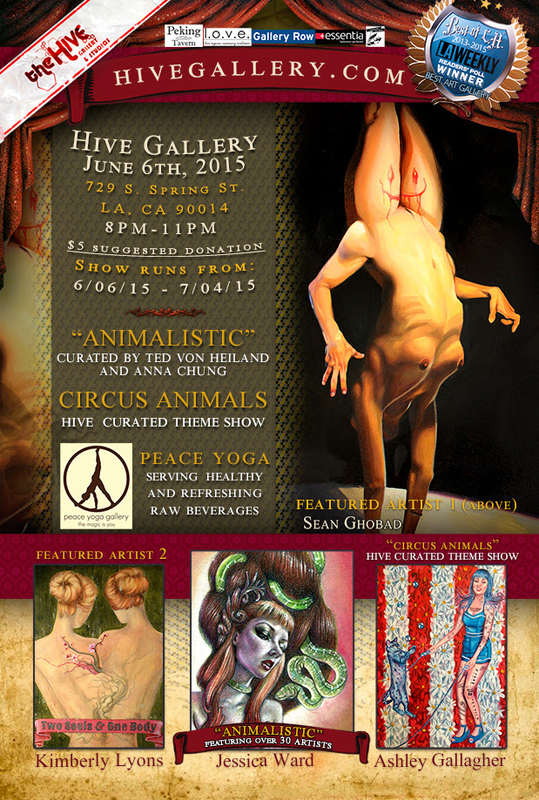 that I have been exhibiting at The Hive Gallery in Los Angeles. Framed print is available directly through the gallery. Please, contact the gallery for more info. Exhibition "The House of Peace" | Italy | "Human rights?" 101 artists from 25 countries have been invited to take a part in an international art exhibition "La Casa Della Pace" ("The House of Peace") organized by "Human rights?" - SpazioTempoArte. I feel very happy to be one of those 101 artists and I feel very honored to show my vision of peace to the world . Thank you! Read more about this incredible project directly on SpazioTempoArte website here where you can find all important information about this organization and their mission. During the event will be organized conferences about human rights, peace and social commitment managed and promoted by the Foundation. The exhibition will be animated through performances of international artists, action paintings, meeting with artists that will be available to talk about their works. During the evenings will be organized inaugural artistic performances. During the exhibition SpazioTempoArte will organize guided tours for groups of visitors and school groups. 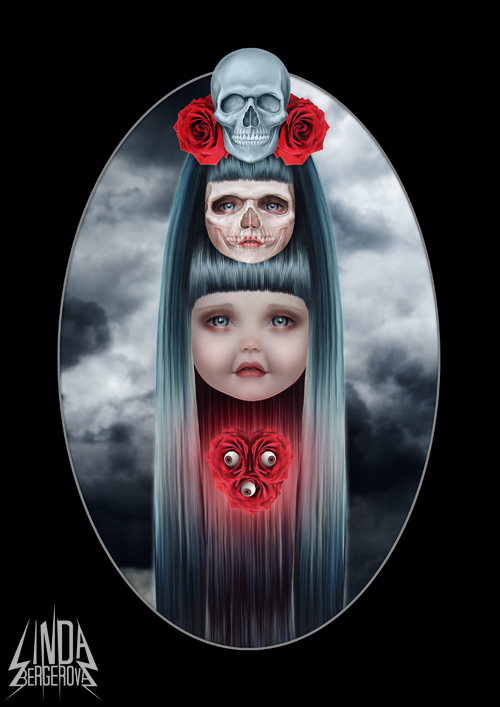 My art will be available for purchase directly during the exhibition or please, contact SpazioTempoArte for more info. 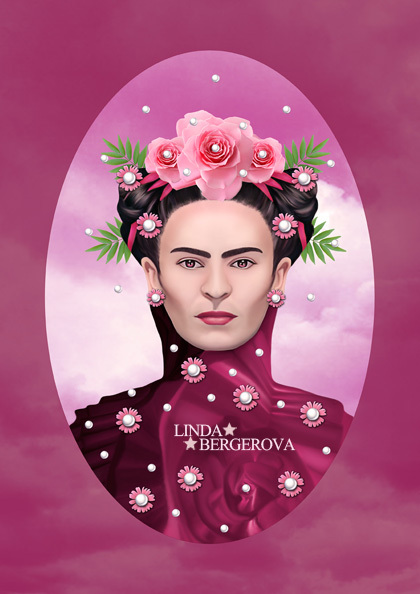 Digital surreal art "Child of Universe"
Digital surreal art "Pink Frida"